Pope Francis delivers his message in the Paul VI hall on the occasion of his weekly general audience at the Vatican, Feb. 6, 2019. Telling pilgrims at the Vatican Wednesday about making the first-ever papal trip to the Arabian Peninsula, Francis described his encounter with leaders of Islam as a counterpoint to the "strong temptation" to contend there's a current clash between Christian and Islamic civilizations. 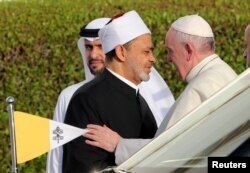 While in Abu Dhabi, Francis signed a document with the grand imam of al-Azhar, the ancient seat of learning in Sunni Islam, condemning religiously motivated and other violence. The pope said the two religious leaders wanted to give a "clear and decisive sign" that respect and dialogue is possible between the Christian and Islamic worlds.